Earlier in the month, Bass Pro Shops announced that it will acquire fellow outdoor recreation and apparel retailer Cabela’s in an all-cash deal for approximately $5.5 billion. 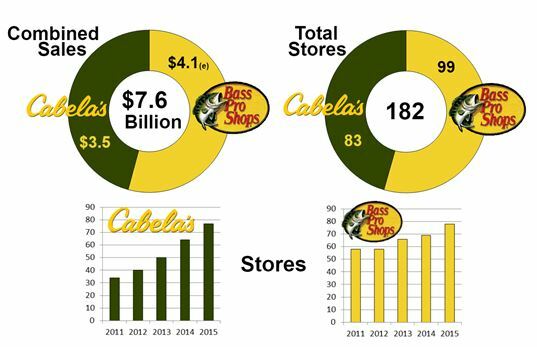 The deal, which will close in the first half of 2017 and see Cabela’s taken private by closely held Bass Pro Shops, creates an outdoor retailer with more than $7.6 billion in annual sales, according to Chain Store Guide estimates, covering approximately 20% of the market. In apparel terms, the combined companies account for $1.3 billion in sales annually according to CSG’s Database of Apparel Specialty Stores. Assuming that no Cabela’s stores are shuttered in the process, the combined organization will be approaching 190 North American stores by the time the deal closes. Source: Chain Store Guide Database of Apparel Specialty Stores. *CSG Projection. Estimates based on proprietary trend analysis and company comments. Actual figures are subject to change. This data is not intended for investment decisions. Cabela’s has struggled in recent years. Revenue has risen on the back of large-scale store expansion but the company has seen net income head south and same store sales decline more often than not. One factor blamed for falling comparable store sales has been the company’s growth, itself. There’s a feeling among part of its customer base that Cabela’s product assortment has shifted from the desired high-end, specialty apparel and equipment to merchandise that appeals more readily to the masses. Bass Pro Shops is betting that a steady hand free from the pressures of Wall Street investors, a more measured approach to expansion and some level of economies of scale can right the Cabela’s ship at the store and company level.